We can learn from the smart thinking of bees, who use a special ‘bee glue’, which we call propolis, as their ‘secret weapon’ to protect the hive from harmful germs and the effects of the weather. 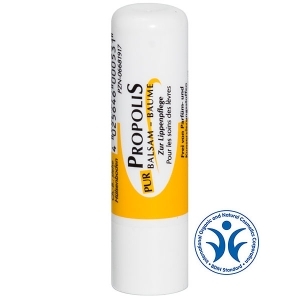 The outstanding properties of this natural substance come to the fore in our propolis products. Our priority is quality: this applies to the production process, the conventional ingredients and the natural raw materials, too. 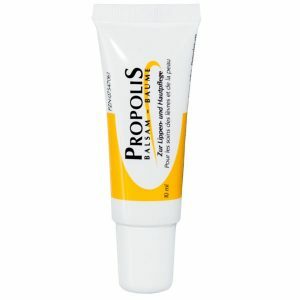 Our Original Propolis Lip Balm Stick soothes and relaxes your lips, protecting them from harmful environmental factors. 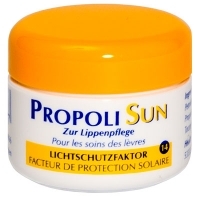 It also provides UVA / UVB protection. 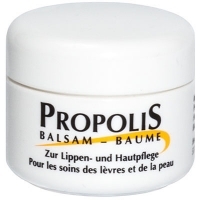 Our Propolis Balm has a special tube opening designed for easy, accurate application and spreading on your lips, as well as on other small areas of irritated skin. The sophisticated recipe includes valuable natural ingredients, including propolis and pure jojoba oil. This helps prevent your skin from drying out quickly and gives the balm a very silky feel. This soothing balm is one of the real favourites in our range. The natural ingredients have proven to be very beneficial for dry and chapped lips. No colours or preservatives. 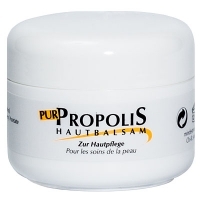 Nature, and nothing else: Our Propolis PURE range is based on natural active ingredients only. The quality of the range is reflected in the fact that the lip care stick is the only product of this type in the world to be awarded the quality mark “certified natural cosmetic” from the BDIH, the Federation of German Industrial Companies and Trading Firms. Even the bees are astonished! 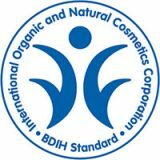 Our PROPOLIS PURE Lip Care Stick has been awarded the quality mark “certified natural cosmetic” from the BDIH, the Federation of German Industrial Companies and Trading Firms. The balm is easy to apply to your lips and forms the perfect ‘foundation’ for lipstick. It contains no artificial colours, perfumes or preservatives. Propolis and organic beeswax provide natural lip care and protection from harmful environmental factors – all here in a practical jar. 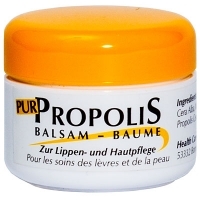 This balm is also free from colours, perfumes or preservatives, like our PROPOLIS PURE Lip Care Stick. This skin balm provides excellent holistic skin care, especially for skin that tends to dry out easily, with its selected natural active ingredients. Refatting substances prevent your skin from drying out again, and a high proportion of organic beeswax enhances the protection it provides. The skin balm contains no artificial perfumes or preservatives. Bees produce and use a natural putty-like resin which we call propolis. It has astonishing health-promoting properties. 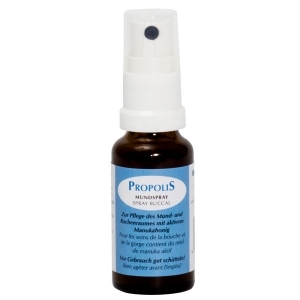 Propolis includes essential oils, tree resin and bioflavonoids (plant-derived secondary active ingredients). The anti-oxidative properties of the bioflavonoids can make a highly valuable contribution to a healthy immune system – whether in combination with conventional substances or as a pure, natural product. Our sunscreen specialist takes the proven properties of our other lip care sticks and adds the enhanced protection and care which will shield your lips in strong sunlight, making it suitable for skiing, hiking, climbing or a day at the beach. 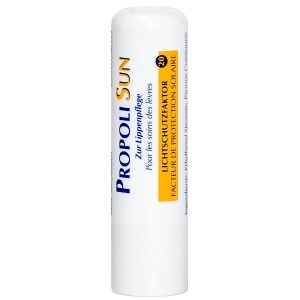 Its SPF20 rating meets Colipa requirements for balanced UVA / UVB protection. 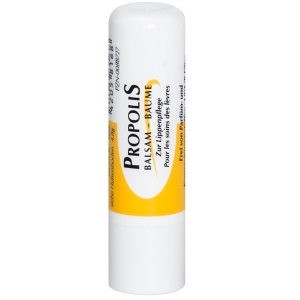 The stick is manufactured using plant-based oils and waxes, with the addition of Vitamin E.
The Propoli Sun Balm Jar provides the same reliable protection in strong sunlight as the Propoli Sun Lip Stick. Its microfine mineral sun protection factor makes it particularly suitable for sensitive lips, as well as your nose or ears. Health from the beehive: The active ingredients in propolis have antibacterial, antiviral and antifungal effects, making it especially valuable to us in our health care products. 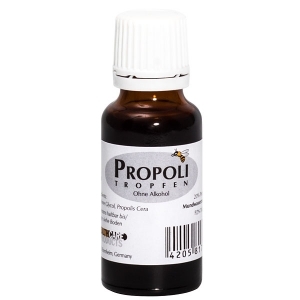 As it does for the bees, propolis also helps us humans to have a healthy immune system. Put the sting in your health: Our propolis drops will enhance your immune system and protect you from all sorts of harmful germs. These drops are also very beneficial for strengthening your gums. Our expert tip: Relieve your baby’s teething problems by rubbing these drops carefully into their gums with your little finger – this worked very well with our son. Natural defence to carry with you: The mouth and throat spray brings together the highly beneficial active ingredients from two natural sources: propolis and manuka honey. It keeps your breath fresh and ensures rapid disinfection of your mouth and throat. These effects make it an essential companion to have with you while on the move. The high honey content also gives this spray a great taste. 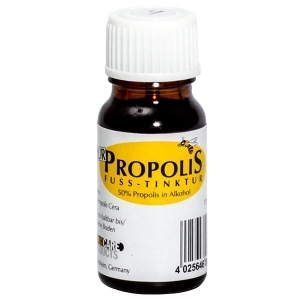 This 50-percent solution of propolis comes as our recommendation for treating any skin problems. It has proven particularly beneficial in cases of athlete’s foot or fungal infection of the nails. Our special tip is to apply the solution several times a day with the brush supplied, until the affected area shows signs of improvement. 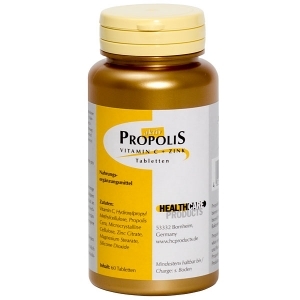 Our Propolis Vitamin C + Zinc pills are a dietary supplement which can help enhance your immune system. They contain no sugar, sodium, gluten, yeast or milk products and are also free from artificial colourings, flavourings and preservatives. Recommended for sportspeople, too. Manuka honey is a natural remedy with very strong anti-bacterial effects thanks to its natural ingredients created as bees gather the pollen from Manuka myrtle flowers. With the highest known concentrations of methylglyoxal of any honey, this unique honey has effects 10 to 20 times stronger than normal honeys. This is why it is so valuable for us in our natural cosmetics and health care products. Concentrated bee power: The anti-bacterial effect of manuka honey is shared by no other honey type, making it extremely valuable as an ingredient in our natural cosmetic and health care products. For our Manuka products, we only use the highest-quality New Zealand manuka honey from authentic sources. Natural defence to carry with you: The mouth and throat spray brings together the highly beneficial active ingredients from two natural sources: propolis and manuka honey. It keeps your breath fresh and ensures rapid disinfection of your mouth and throat. These effects make it an essential companion to carry around with you. The high honey content also gives this product a great taste. 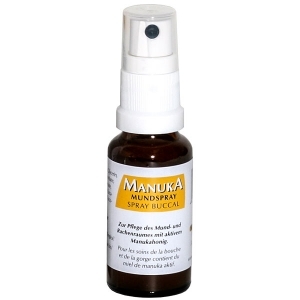 Natural defence against harmful germs and bacteria: Thanks to the outstanding, proven anti-bacterial action of manuka honey, our manuka mouth spray is superbly suited to mouth and throat disinfection. 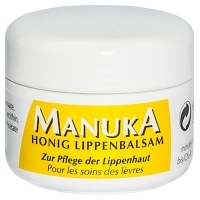 Our Manuka Honey Lip Balm offers you natural lip care of the highest quality. The beneficial properties of organic beeswax and the unique anti-bacterial effect of manuka honey (10 to 20 times stronger than any other honey) combine to ensure your lips remain noticeably soft. 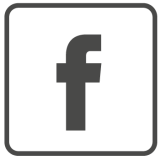 Do you have questions on our products, their ingredients, or our sales channels? Please take a look at the questions and answers in our FAQ section. Or just talk to us – don’t worry, we don’t sting!